Your New Jersey Web Site! 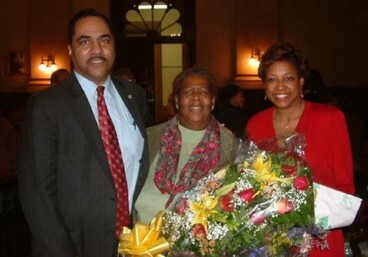 Lavern Webb-Washington, who was awarded the Harriet Tubman Award to for outstanding work in her community, stands with Mayor Glenn D. Cunningham and First Lady Sandra Bolden-Cunningham following the Black History Month program at City Hall on Monday, Feb. 23, 2004. February 25, 2004 "Mayor Cunningham to Break Ground on West Side Housing"
February 24, 2004 "Mayor Cunningham to Host Final Day of the 9th Annual Jersey City MLK Oratory Contest"
February 23, 2004 "Mayor Cunningham to Celebrate Dominican Independence"
February 20, 2004 "Jersey City's Premiere African-American Historian to Speak at Black History Month Celebration"
February 18, 2004 "Mayor Cunningham to Break Ground on Multi-Million Dollar Housing Development"
February 13, 2004 "Mayor Cunningham Welcomes Eden Baskets to Jersey City"
February 3, 2004 "Black History Month Exhibition to Feature Work of Muhammad Ali Biographer"
January 22, 2004 "Mayor Cunningham to Launch Voter Education Drive"
January 14, 2004 "Mayor Cunningham to Honor Dr. Martin Luther King, Jr. at City Hall Celebration"
January 12, 2004 "Mayor Cunningham to be Sworn in as State Senator for 31st District"
January 6, 2004 "Mayor Cunningham to be Subject of Junior High Students Journalism Projects"